So I knew whose stories I wanted to write, even though I wasn’t sure they’d all belong in book 2. And I wanted to make this book stand on its own more than I’d managed with Threat Multiplication (book 2 in the Slowpocalypse series) – though Centenary Separation would be more of a sequel than that had been. Fortunately, I’d learned a lot through the experience of writing Threat Multiplication and from the feedback I’d received. But I’d also have new challenges writing this book. All my stories so far had tied their main threads together for the end. But though there would be some connections between the various plots in Centenary Separation, I knew from the beginning that this book wouldn’t be tying everything up in a bow. Anya would be mostly on her own. As would Nye, whose story I doubted would even make it into the book. And Verity and Turner were destined to be kept apart (at least for the time being.) Only Matt and Page’s stories seemed closely bound. In Millennium Crash, Sam’s and Matt’s subplots weaved intricately in and around Anya’s central strand. 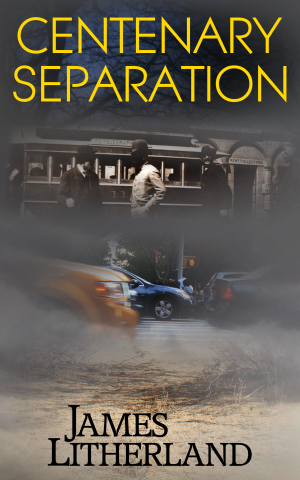 Now I faced the challenge of bringing together in one book several strands that simply couldn’t be woven into one overall plot – some stories were defined by their separation. And this would be the first time I’d be writing from the perspectives of three of the six characters. It would be different and more difficult than any book I’d written yet. First of all, none of the character’s stories was really the main one. But at least Anya’s POV, with the prologue establishing the basis for the book and the end tying together her story with Verity’s, provided a throughline for some structure. Matt and Page’s storylines, though, while coming together for that couple, also cut the pair off from the rest of the travelers in the same way Sam and Bailey had been separated from the main group in Millennium Crash. It needed to be that way, but it made it more difficult to balance the book. With Turner also all alone in his own separate story, it seemed even more likely that giving Nye anything but a cameo appearance wouldn’t work. Still, I was so eager to write about her adventures that I went ahead and wrote her scenes in turn as I alternated between the characters. And she was easily the most fun to write. So this book required a lot of subtle touches – establishing the characters and the backstory so the book could stand alone without a lot of heavy exposition, and also letting the various stories play off of each other even when their plots weren’t really connected. Comparing and contrasting the two couples and how they dealt with their separation from each other was one technique to do that. Using the theme of everyone being alone and on their own was another. Though I wrote the first draft focused on these as separate stories, by the time I’d finished, they’d come together more than I’d anticipated. And in some surprising ways. But I began thinking of them as distinct tales, so that’s how I’ll tell them. Starting with Anya.